This is the gorgeous spiral galaxy M106 or also known as NGC 4258. It is located 23.5 million light years away and it would take you 80,000 light years to cross from one end of the galaxy to the other. What is interesting about this particular galaxy is the fact that it has an unusual amount of arms. It has 4 arms that are in spiral formation and the two arms that are mostly red (known as anomalous arms, because they don’t line up well with the other arms) is hydrogen that is spewing out from the supermassive black hole. That red color is also an indicator to astronomers that the hydrogen is excited. So what is causing all this excitement? The jets coming from the supermassive black hole are likely to be caused by matter falling into it then the beam of cosmic death rays shoot out and excite the material around it. This is not a galaxy you would want to fly anywhere near because those cosmic death rays shoot out at least a thousand light years out. We know that all big galaxies have a supermassive black hole in the center. Our very own Milky Way has a supermassive black hole that is 4 million times the mass of our sun. This galaxy has a supermassive black hole that is 30 million times the mass of our sun! 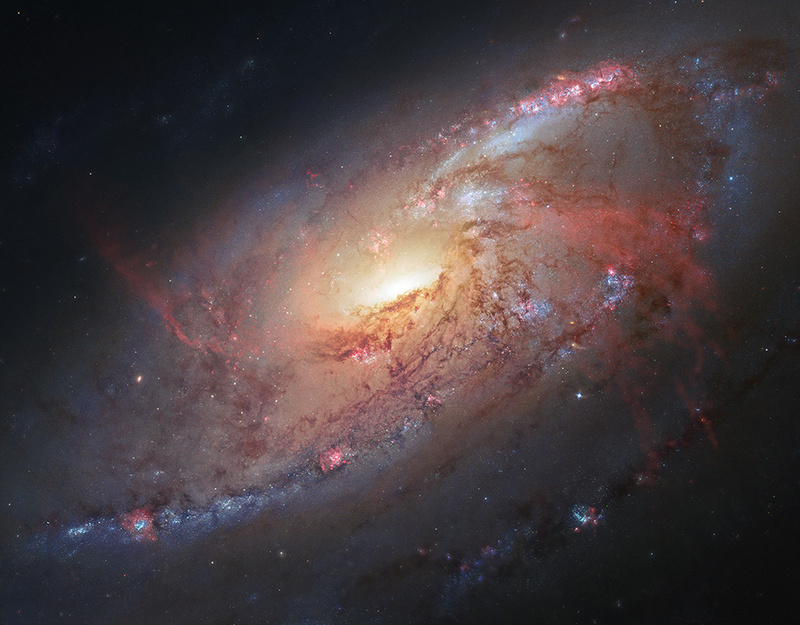 Here is a video of where the galaxy M106 lies. It’s pretty cool to see in perspective!